50 places are available for any student and professor interested. To participate, sign up on the list and bring the fee at the Front Office before Monday, April 3, at 4.3o pm. 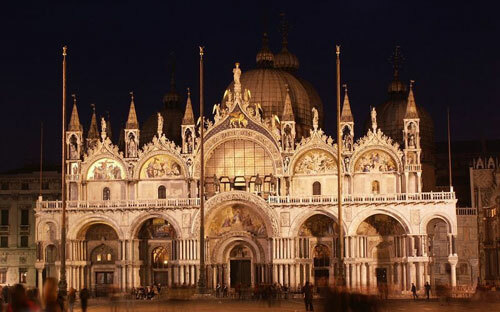 The Patriarchal Cathedral Basilica of Saint Mark is one of the best known examples of Italo-Byzantine Architecture. It lies at the eastern end of the Piazza San Marco, adjacent and connected to the Doge’s Palace. Originally the chapel of the Doge, it was chosen as the city’s cathedral only in 1807, when it became the seat of the Patriarch of Venice. For its opulent design, gold ground mosaics, and its status as a symbol of Venetian wealth and power, from the 11th century on the building has been known by the nickname Chiesa d’Oro (Church of gold). This is a unique opportunity… Do not miss the chance of a night-time guided tour of the Basilica with us!